Dog are very conscious of your body language and movement. This is especially true for Australian Shepherds as they are a herding breed. Aussies use their position relative to sheep or cattle to move them along and guide them in a particular direction. They block the route they don't want the sheep to take or leave open spaces for the sheep to move into. Depending on their temperament or state of mind on any given day, or in any given moment, the sheep will comply calmly or become agitated. They may even panic. The best herding dogs will keep everyone moving along closer to the calm end of the scale. You can use the same tactic when dealing with your dog. You might be surprised how well your dog will respond to subtle movements on your part. For example, your dog is in the sit/stay position, but you see that they are about to break the stay and move to your right. Try just shifting your position in the direction to block them. You are effectively claiming that space. Some dogs are better than others at reading these movements but you might find that as you get better at it you only have to make subtle shifts for your dog to respond. 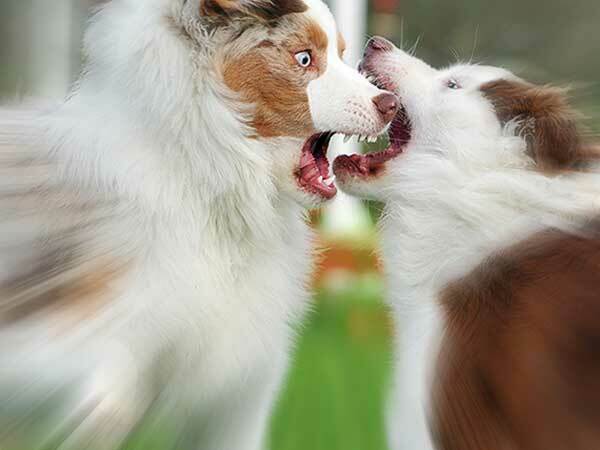 Friendly face to face meetings between humans are common, but face to face greetings between dogs can spell trouble. You can use your knowledge about canine body language to solve and even prevent problems. Be aware not only of the space that you move into to control it but be conscious of your body's position in relation to your dog as well. As humans interacting with each other we know that "body language" plays a huge role in communicating with each other but it is for the most part unconscious. Your dog is also picking up on your body language but it may not necessarily mean the same thing to them as it would to a person. Are you facing them straight on? Is your body leaning toward them or away? If we face another person directly and lean toward them it could be taken as friendly or aggressive depending on the context. It could be someone we like and are leaning in for a hug or a kiss. We can also imagine an overbearing bully towering over someone while leaning over them and violating their personal space in an attempt to dominate. Since dogs stand on all fours and don't have their "hands" free for such interactions they generally don't take the face to face approach. When they do so with each other it is usually an indication of one dog attempting to dominate the other and a sign of impending aggression. Relaxed, friendly meetings between dogs are generally initiated from the side with a body position that leans away. If you see a dog start to lean toward another dog, especially if accompanied by a stiffening of their legs and body with a hardening of their gaze, things are about to take a turn for the worse. Think about meeting a strange dog. Do you approach them directly? Do you lean over them and extend your hand? If it is a lost dog you are trying to help and you want to get them to come over to you this approach might have the opposite effect and make them run away from you all the more. Try turning to the side, lean away, and even move in the direction away from the dog. This presents a non-threatening stance and moving away will invite them to follow. Once you see how dogs respond to control of space, body positioning and body language you'll wonder how you ever got by without it. You'll be speaking a language your dog already understands intuitively. Of course, you can use this as a starting point in order to communicate the behavior you want and then attach a verbal command or hand signal after. While this knowledge can help you better understand interactions between dogs and people as well as between dogs and other dogs, it will also help you build a better relationship with your dog. It is a great tool in your dog training toolbox that you don't want to be without.